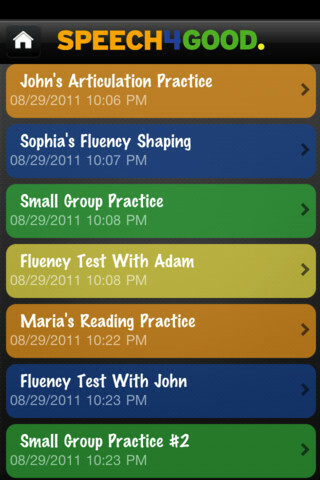 A week ago I updated my Apps for Voice, Fluency, Hearing, and Dysphagia List and included Speech4Good on it. This is due to the fact that you can record a sample of a students'/clients' speech and play it back for them as well as view the oscilloscope for visual feedback for voice/articulation therapy. 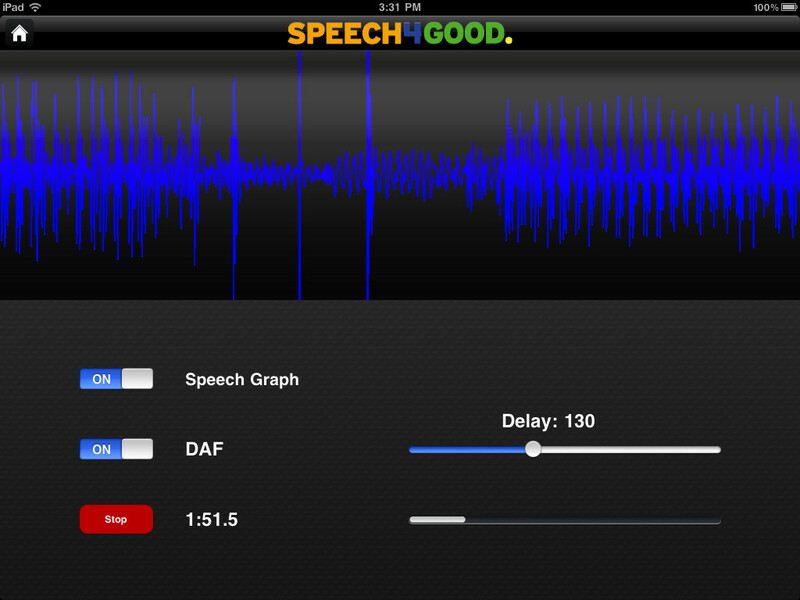 Also, a person who stutters can use the app for Delayed Auditory Feedback. Balbus Speech contacted saw the list and contacted me about writing a review of Speech4Good. Read more below to find out what I thought about their app! Pressing this button will bring you to the bulk of the application. An oscilloscope will show speech visually as the user speaks at the top of the page. Waves become more amplified as volume increases. This option can be turned on and off via the "Speech Graph" toggle switch if it is too distracting for users. Delayed Auditory Feedback (DAF) is another function of the application which can be turned on and off via a toggle switch as well. You are able to choose how much of a delay the application will provide via a scrolling bar and set it between 20 and 300 milliseconds. To use this function, you must have headphones, otherwise it will not work. Finally, there is a button to record a students'/clients' speech at the bottom left hand side of the page in green. Press "Record" to record the users' speech. The application will record speech via the microphone and display a timer/bar showing the minutes/seconds elapsed in the recording. You can record up to ten minutes for a session. To end the recording, press the "Stop" button. This will then bring you to a pop-up menu where you can type in the title of the session and any notes on student/client progress by pressing on the white fields and typing via the keyboard. Then, you can save the session to the "Library" by pressing "Save Session" or "Cancel" to go back to the application itself. When you choose to save the session, it will ask you if you want to e-mail the session, share it on Facebook, or share it on Twitter. If you do not want to do any of these things, you can press "Cancel" to go back to the page or "Skip" to save it to the "Library" only. If you choose to e-mail a session, make sure that your e-mail account is linked to the Mail app included on your iPod Touch, iPhone, or iPad so that you can e-mail the session from your device. The "Home" button will bring you back to the main menu page. This is where saved sessions will be kept in a list format by title and the date the session was saved. You can view a sessions' information and listen to the associated speech recording by pressing on the sessions' title. The session, date the sample was taken, and notes will then appear. The recording is at the bottom of the page. Press the play button to listen to the recording, pause button once you have started play-back to pause the recording, and the stop button to end the recording play-back. The bar below these buttons will show the time elapsed and the total amount of time. If you wish to edit the title of the session or the notes associated with it (you cannot edit the date or recording), press the "Edit" button at the bottom of the page. Then, choose the information in which you would like to edit by pressing on the white space associated with that section and edit it via the keyboard. Once you have completed editing the information, press the "Done" button. If you wish to e-mail a session in the future or share it via Facebook or Twitter, you can press the "Share" button. To delete a session from the "Library", swipe your finger to the left over the session you wish to delete. A red "Delete" button will appear. Press it to delete a session. This will show a list of sessions you have shared with others, how you shared them (via e-mail, Twitter, or Facebook), the title of the session, and the date in which the session was shared. This is great to keep track of communication with parents and keep a log of when you contacted them with a recording/notes on the session. When you use Speech4Good, you do not have an actual "Speech4Good account", but you can manage which social media accounts you will use the application with. Press the "Account Settings" button to view Speech4Good/Balbus Speech's Privacy Statement (via the internet), log in to Twitter, or log in to Facebook. This will link your Twitter/Facebook accounts to the application, but you still control when you share information with those social media networks. the "Support" button will bring you to frequently asked questions (FAQs), a user forum, or will allow you to e-mail Balbus Speech. If you choose to e-mail Balbus Speech for support, make sure your e-mail is linked with your the Mail app on your iPod Touch, iPhone, or iPad because a pop-up box will appear for you to send them an e-mail. Links associated with the "About Us" button include the ability to visit Balbus Speech's website (via the internet), "Like" them on Facebook, or "Follow" them on Twitter. Speech4Good has its own website linked to Balbus Speech that can be found here. I love the fact that this application includes visual feedback. This is great for students who are working on voice, fluency strategies, and articulation by viewing the length and amplification of a syllable/phoneme, length and amplification of a disfluency, change in amplification when using a fluency shaping/modification strategy, and amplication of the voice. It is also motivating for students/clients. I also like the fact that this application includes Delayed Auditory Feedback (DAF) for people who stutter to use and the fact that they have the ability to set the delay. Having the ability to record a speech sample is great because then you can save it to the "Library" for future reference, to share with parents/other therapists via e-mail, or to play-back at conferences/IEPs. 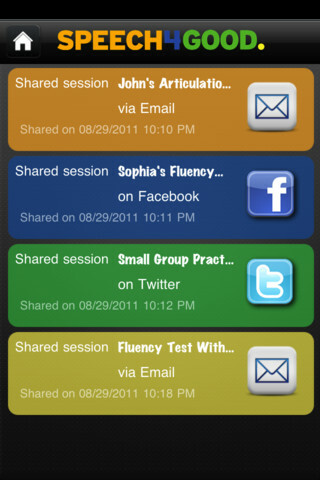 You can also record multiple sessions for a student/client and play them back to show progress. It is also great to see which sessions you have shared so that you know for a fact that they have been passed on and which date they were passed on. This is great for keeping a log of parent/therapist/teacher contact. The application is clean and professional which causes less distractions and ease of use. I know that Balbus Speech takes pride in the ability to share sessions via Facebook and Twitter, but to be honest, I can see no reason why I would ever share a session via Facebook or Twitter. Due to the fact that these social media websites can be accessed by the public, this would be a violation of HIPAA to share sessions, especially if a student/client is easily identifiable by his or her voice. I would share progress via e-mail with a parent, therapist, or teacher but only if I had permission from the parent/guardian to do so. I know that Balbus Speech states that they value privacy, but I honestly just cannot think of any reason whatsoever that I would ever want to share a session via a social media website with anyone. I would honestly like to see the ability to share via Facebook and Twitter removed unless someone can think of a good, safe (privacy-wise) reason for me to share a session via a social media site. Even though you are prompted to sign in each time you press to share to Facebook/Twitter, I still do not understand why these options are included at all. I would love to have individual accounts for each student/client so that I can save them all in one place and when I access the "Library", parents/other therapists will not see the other sessions available for play-back. Also, it would be nice to have the accounts password protected. On the iSpeech Center screen, I would like to see data as to what the oscilloscope is measuring as well as the unit of measurement associated with the Delayed Auditory Feedback (I know that it is associated with milliseconds, but what about another user?). On the Sharing screen, I would also like to see who I shared it with listed as I cannot press the session to view further information. Fluency: This application provides DAF to help people who stutter speak more fluently while listening to their voice with delayed play-back in real-time. You must have headphones to use this function. Also, you can have the user listen back to his or her own recorded speech to analyze his or her fluency during the sample. You can listen to the students'/clients' progress throughout the year by listening to prior recordings and comparing them to more recent recordings. You can also view the use of fluency shaping/modification strategies on the oscilloscope. Voice: Have students view feedback on their voice via the oscilloscope. The oscilloscope with show amplitude upon increased volume. You can listen to the students'/clients' progress throughout the year by listening to prior recordings and comparing them to more recent recordings. Articulation: Record a sample of the users' speech (spontaneous or elicited) and have him or her listen to it to analyze his or her own speech sounds. You can listen to the students'/clients' progress throughout the year by listening to prior recordings and comparing them to more recent recordings. Also, the student/client can view the emphasis on various phonemes/syllables by keeping his or her eye on the oscilloscope. Expressive Language: Record a students'/clients' speech and language sample (spontaneous, elicited, or a narrative) via the application with the oscilloscope turned off so that it does not distract the user. You can then play it back to type the sample and play the sample at an IEP/conference. 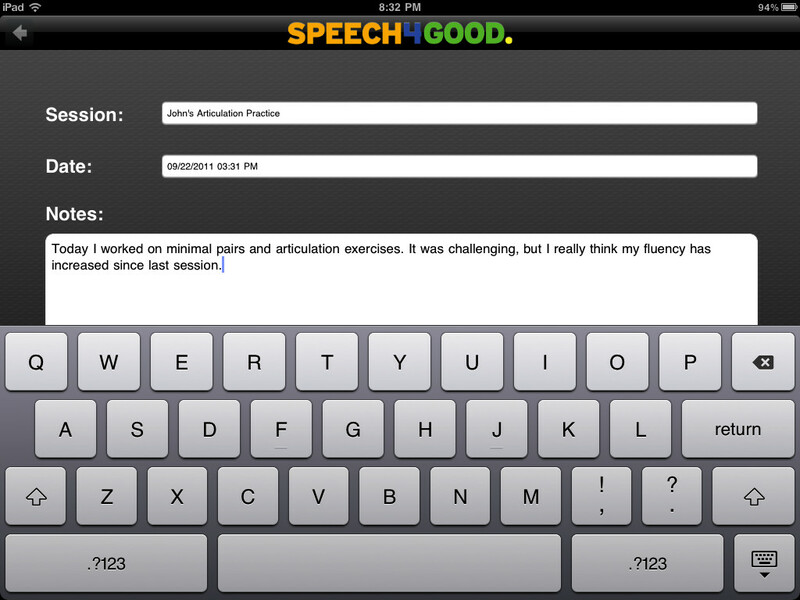 Speech4Good is available on the iPod Touch, iPhone, and iPad for $19.99. This is a great application for voice, fluency, and articulation therapy. With the visual oscilloscope and DAF functions, this application is definitely a great tool for therapy. However, with the ability to share sessions via Facebook and Twitter could possibly be a violation of HIPAA if you use it improperly. The privacy settings of social networks are not meant to protect medical information/recordings/notes. I would caution against using this function, especially if you write notes containing any sort of identifying information in them. The ability to send information via e-mail and save sessions on the "Library" definitely saves time in recording data. Overall, I think that this is a great therapy tool except for the social media buttons/sharing ability. 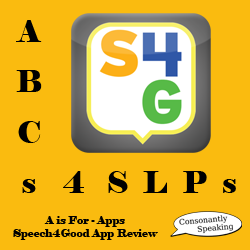 Consonantly Speaking was given an application code by the developer to review the application on this website. No other form of compensation was given.